Wolves' August loan signing Adam Le Fondre is looking to forge a rapport up front with Benik Afobe, after a knee injury ruled Nouha Dicko out for the remainder of the Championship season. 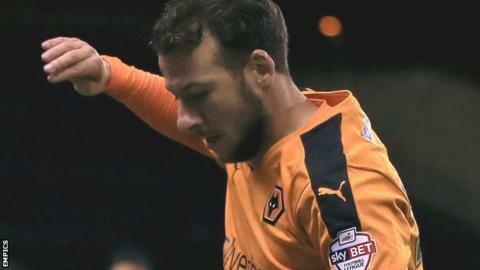 "It was a horrible injury," Le Fondre, 28, told BBC WM 95.6. "You don't wish that on anyone, but it opens the door for me and Benny to form a partnership. "I think the fans will like what they see when we really get going. "I can bring the best out of Benny. He can benefit from my experience." Le Fondre, who is on a season-long loan from Cardiff, added: "The opportunity is there for the two of us to get a good understanding." Adam Le Fondre has scored 173 goals in 448 games for Stockport, Rochdale, Rotherham, Reading, Cardiff, Bolton and Wolves. Le Fondre scored eight goals in 17 games on loan at Bolton last season. Le Fondre scored his first Wolves goal with a late winner against Charlton in the final game before the international break. He faces one for his former clubs on Saturday when Wolves go to Bolton, where Le Fondre rejuvenated his career under Neil Lennon during the final three months of last season. Wolves boss Kenny Jackett has joked that Le Fondre should give a slideshow presentation ahead of Saturday's game. Le Fondre added: "They've got a few new players in since last season who I don't know, but what I do know is that I had a great three months there under Neil Lennon. He was brilliant for me. "I was having a bad spell at Cardiff. A lot of things were happening but the fact is I wasn't playing well enough and wasn't scoring enough goals. "He invigorated me and brought the best out of me."